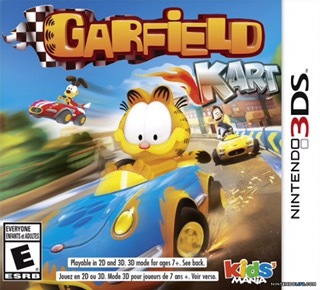 I was hoping this game was going to be a Mario Kart clone, well it kinda is because of the racing and all but other than that Garfield Kart is a bad game in general. The controls are loose and clunky and needed to be tighten up. There are only sixteen tracks and they all are about the same. On the plus side you do have a cast of characters from the Garfield universe like Jon, Liz, Arlene and even Pooky. The music in the game is repetitive and gets old fast and the power ups don’t work half the time because if you don’t read the digital manual you won’t know what they do. For example, lasagna will make you go faster and a spring will make you jump a few feet ahead. I dropped thirty bones on this game and after three hours of game play I have beaten every challenge and there isn’t any online multiplayer to keep me coming back. Don’t even bother dropping cash on Garfield Kart, get Mario Kart instead.